If you have been following my blog you know I said I would have a Big 3D project. 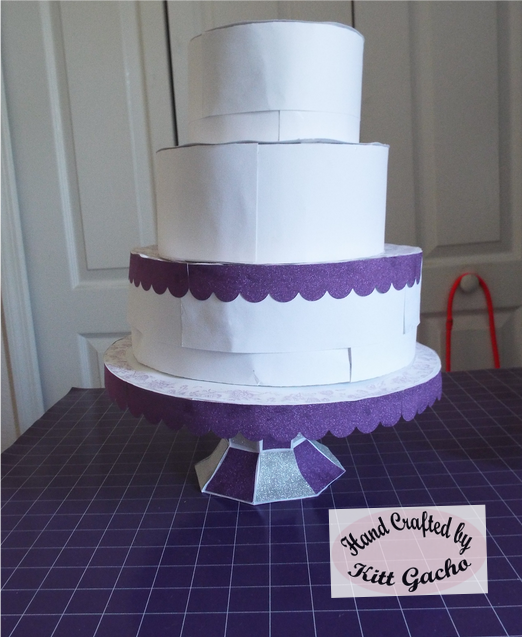 I have entered this as my project for the DT over at Decorate to Celebrate. Be sure to see what the talented team has for your 3D inspiration projects. 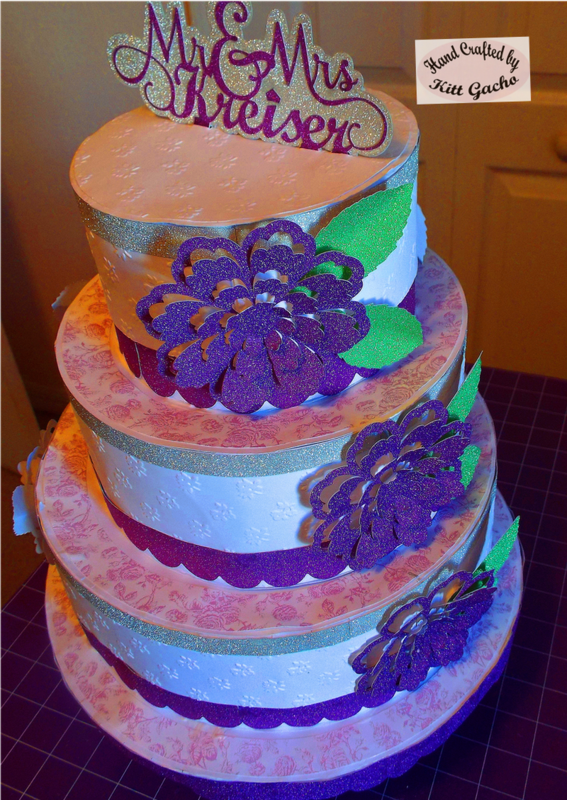 In following up with the wedding theme of purple for my friends wedding. Here is a 3 tier cake box set. I glued the boxes and pedestal together but she could still open each box lid. She used the bottom box to insert her gift cards she received at the reception. You can view the name from both front (with purple flowers) and back of cake with silver flowers. Unfortunately, these pictures don't show the glitter paper very well. It looks beautiful in person. I used glitter paper for the base of the Mr. & Mrs. sign. I purchased the cake file from SVG cuts. The flowers are cut files from the Silhouette store. In the picture below you can see I had to cover the outside layers. 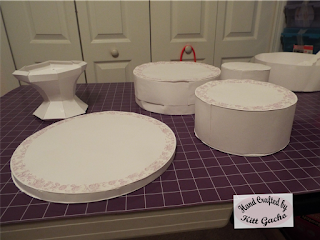 I used We R Memories roses embossing folder to cover the outside layer of the boxes. 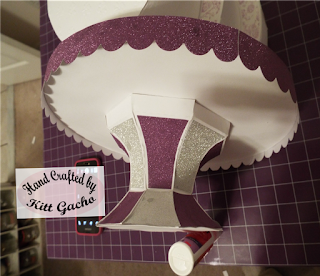 Here is what the boxes and pedestal looked like earlier. I used purple and silver glitter paper for the pedestal and trim around the boxes. 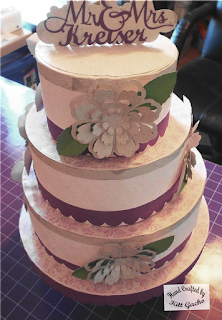 The floral paper around the circles of the layers is from my stash. Thanks for stopping by today and leaving your comments. I love hearing from you. Have a happy crafty day. Such beautiful creations!! Awesome job! Oh, how creative Kitt! I bet the bride loved that idea! Thank you for sharing your project and creativity at 613 Ave C! Lovely creation, thanks for sharing with Crafting from the Heart! Great project! They are beautiful. You did an amazing job. Thanks for sharing with us over Inspiration Destination.Good luck!!! Patricia DT. Wow! What an amazing project!!! A lovely thing to do for your friends. So much time and effort shows great love. So many thanks for sharing this with us at Unstampabelles. What a great gift idea! Thanks for joining in the Paper Nest Dolls Challenge this time. Hope to see you again. Wow! Amazing!!! Thanks so much for participating in our LEMON SHORTBREAD challenge!!! Can’t wait to see you participate again in our challenge in the new year! !